It is very profitable and is produced in low-wage countries. It can be used in a variety of ways – in food, in detergents and in cosmetics. It replaces, for example, oil-based ingredients in the detergents, in soaps and shampoos. Since 3 tons of palm oil can be produced on one hectare of land per year, it is relatively cheap. It could even be said that the landuse is much lower regarding palm oil than for other vegetable oils. 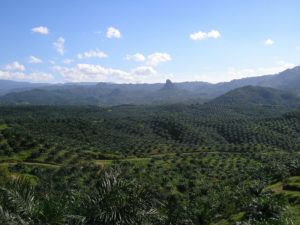 85 % of the palm oil is produced in Malaysia and Indonesia. These are countries that used to be almost entirely covered with rainforest. Wilmar International, Sime Darby, ioi group and Kuala Lumpur Kepong. 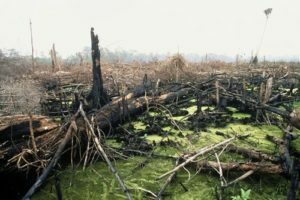 Governments give concessions to palm oil companies which entitle them to cut down trees, to burn the rainforest and to build palm oil plantations there. How these concessions were awarded and on what conditions, I do not know. There is a presumption that corruption has been done on a large scale. The indigenous inhabitants of the rainforest are displaced, the animals burn or die in the escape. Habitats that are essential for biodiversity and for the planet’s ecosystem are irreversibly destroyed. But because this would be not so cheap – the rainforest-teakwood is sold to finance the plantations, the rainforest soil belongs to the state and its citizens, but because of the corruptive circumstances, it is practically unprotected – the groups prefer the destructive alternative. Even “Organic Palm Oil” is not automatically environmentally friendly, because it is usually grown on former rainforest ground. 2. The palm oil plantations, which were built on rainforest soil are to be reflected – should the land be turned back in rainforest? This question must be assessed in terms of environmental and social considerations. re allowed to gain the profits for decades …. 4. The Indonesian and the Malaysian Parliament must be convinced that they have a duty to do something about it. 5. The Palm Oil companies should sit down around one table and end the price competition at the expense of the climate. They should agree that they will refrain from further burning down rainforests and impose contract penalties on each other. They should set up restoration plans and repatriate parts of plantations in rainforest, together. The country must return it to the population. When will we have palm oil in harmony with nature? And they have to pay current concession charges that are so high that the state can make some sensible things, for example, to build schools and hospitals and plant trees. Then they can finally advertise their products with a good conscience. It could be easy. And then maybe we’ll pay a little more for the chocolate cream jar, a little more for the detergents and the shampoos. We’ll eat our breakfast bread in a happier way. Let’s tell the palm oil groups: We want to have a happier breakfast!